Q1. 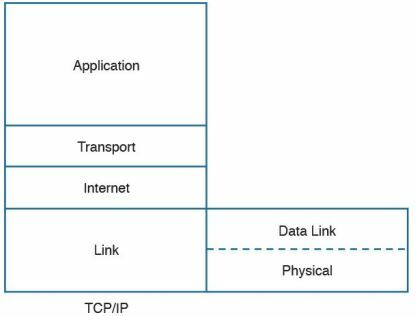 Which layer of the TCP/IP model is concerned with end-to-end communication and offers multiplexing service? Answer: A. The transport layer is concerned with end-to-end communication and provides multiplexing through the use of sockets. Q2. Which statement is true concerning a link working in Ethernet half-duplex mode? A. A collision cannot happen. B. When a collision happens, the two stations immediately retransmit. C. When a collision happens, the two stations wait for a random time before retransmitting. Answer: C. CSMA/CD allows stations to detect a collision. When that occurs, each station waits a random time, called the backofftime, before retransmitting. Q3. What is the main characteristic of a hub? A. It regenerates the signal and retransmits on all ports. B. It uses a MAC address table to switch frames. C. When a packet arrives, the hub looks up the routing table before forwarding the packet. D. It supports full-duplex mode of transmission. Answer: A. Hubs and repeaters simply regenerate the signal and transmit to all ports. Q4. Where is the information about ports and device Layer 2 addresses kept in a switch? Answer: A. A MAC address table includes information about the MAC address and the port where the frame should be forwarded. Answer: A and B. A wireless LAN controller provides station authentication, QoS, security management. and other management services. Q6. Which IP header field is used to recognize fragments from the same packet? Answer: A. The Identification field is used by the receiving host to recognize fragments belonging to the same original IP packet. Q7. Which protocol is used to request a host MAC address given a known IP address? Answer: A. Address Resolution Protocol (ARP) is used to request a MAC address given a known IP address. Q8. Which type of query is sent from a DNS resolver to a DNS server? Answer: A. A DNS resolver sends recursive queries to the configured DNS server. Q9. How many host IPv4 addresses are possible in a /25 network? follows: 2^7 – 2 = 126. Two addresses need to be removed because they are used for the network ID and broadcast address. Q10. How many bits can be used for host IPv6 addresses assignment in the 2345::/64 network? Answer: B. A /64 network allows 64 bits to be used for host addressing. Q11. What is SLAAC used for? Answer: A. SLAAC is a protocol used to generate an IPv6 address. Q12. Which one of these protocols requires a connection to be established before transmitting data? Answer: A. TCP requires a connection to be established through a three-way handshake before transmitting data. Q13. What is the TCP window field used for? Answer: B. The TCP window is used for flow control. Q14. At which OSI layer does a router typically operate? Answer: B. A router mainly operates at the Network layer. C. It makes use of backofftime. Answer: A and B. In full-duplex mode, a station can transmit and receive at the same time. This prevents collisions form happening. Q16. How many broadcast domains are created if three hosts are connected to a Layer 2 switch in full-duplex mode? Answer: D. Because no Layer 3 device is involved, there is only one broadcast domain. Q17. What is a trunk link used for? Answer: A. A trunk link is used to transport multiple VLANs. Q18. What is the main difference between a Layer 2 switch and a multilayer switch? A. A multilayer switch includes Layer 3 functionality. B. A multilayer switch can be deployed on multiple racks. C. A Layer 2 switch is faster. D. A Layer 2 switch uses a MAC table whereas a multilayer switch uses an ARP table. Answer: A. Multilayer switch includes Layer 3 functionality. Q19. What is CAPWAP used for? Answer: C. CAPWAP is used between a LAP and the WLC. Answer: A and B. LAP includes real-time functionalities such as channel encryption and the TX/RX of frames. Q21. Which of the following classful networks would allow at least 256 usable IPv4 addresses? (Select all that apply). Answer: A and B. Class B allows 216 – 2 host addresses. C is incorrect because it allows a maximum of 254 usable addresses. Q22. What would be the maximum length of the network mask for a network that has four hosts? Answer: D. A /29 network can have six hosts, whereas /30 can have only two. Q23. Which routing protocol exchanges link state information? Answer: C. OSPF is a routing protocol of the type link state. Q24. What is an advantage of using OSPF instead ofRIPv2? A. It does not have the problem of count to infinity. B. OSPF has a higher hop-count value. C. OSPF includes bandwidth information in the distance vector. D. OSPF uses DUAL for optimal shortest path calculation. Answer: A. Because OSPF nodes have a full view of the topology, the problem of count to infinity is avoided. Q25. What are two ways the IPv6 address 2345:0000:0000:0000:0000:0000:0100:1111 can be written? Answer: A and C. These are the correct alternative ways that the IPv6 address can be written. Q26. In IPv6, what is used to replace ARP? Answer: C. NDP uses NA/NS messages to provide functionality similar to ARP. Q27. What would be the IPv6 address of a host using SLAAC with 2345::/64 as a network prefix and MAC address of0300.1111.2222? Answer: A. 2345:0:0:0:0500.11FF.FE11.2222 is the correct answer. Q28. What is a DNS iterative query used for? A. It is sent from a DNS server to other servers to resolve a domain. B. It is sent from a DNS resolver to the backup DNS server. C. It is sent from a DNS server to the DNS client. Answer: A. Iterative queries are used between DNS servers. Q29. Which TCP header flag is used by TCP to establish a connection? Answer: B. A TCP client will start a connection by sending a TCP SYN packet. Answer: A, B, C. A network socket includes a protocol, IP address, and port.